The Highland Soil & Water Conservation District’s 76th Annual Meeting will be held Thursday, Oct. 18 at the Ponderosa Banquet Center, 545 S. High St. in Hillsboro. The Highland SWCD will host a social hour from 5:30 to 6:30 p.m. as voting for the supervisor election takes place. A buffet style meal will be served at 6:30 p.m. followed by the presentation of awards beginning at 7 p.m. The program will feature the winners of the County Conservation Poster Contest, FFA land judging and the 2018 Cooperator of Year Award. Call 937-393-1922 ext. 3 to register before Oct. 12 deadline. Winners from the 2017 Highland SWCD Poster Contest are shown at last year’s annual meeting. https://www.timesgazette.com/wp-content/uploads/sites/33/2018/10/web1_SWCD.jpgThe Highland Soil & Water Conservation District’s 76th Annual Meeting will be held Thursday, Oct. 18 at the Ponderosa Banquet Center, 545 S. High St. in Hillsboro. The Highland SWCD will host a social hour from 5:30 to 6:30 p.m. as voting for the supervisor election takes place. A buffet style meal will be served at 6:30 p.m. followed by the presentation of awards beginning at 7 p.m. The program will feature the winners of the County Conservation Poster Contest, FFA land judging and the 2018 Cooperator of Year Award. Call 937-393-1922 ext. 3 to register before Oct. 12 deadline. 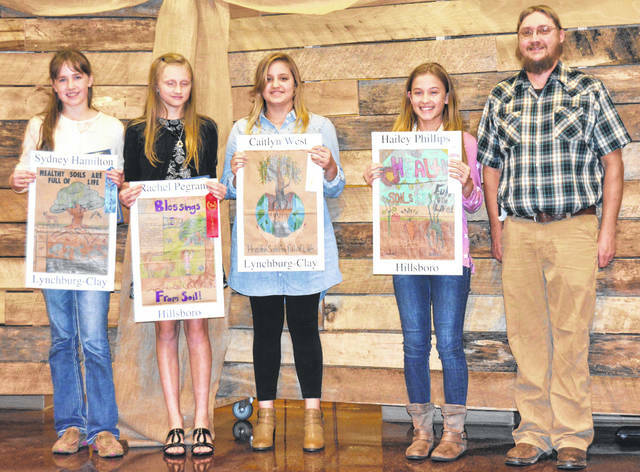 Winners from the 2017 Highland SWCD Poster Contest are shown at last year’s annual meeting.